The decision by President George W. Bush to go to war in Iraq in 2003 was probably made a long time before the actual invasion on 20 March. However, a key role in building a degree of international acceptance for the war was played by the UK prime minister, Tony Blair. 10 years later, we often forget how silly Mr. Blair’s arguments in favour of the war were. For example, while it is true that some attention has been paid to the flawed intelligence with which Blair tried to persuade the House of Commons, most people seem to forget that the argument that seemed to tip the balance for Blair in favour of intervention in mid-March 2003 was the promise by Bush to be “even-handed” regarding the Arab-Israeli conflict in the future! Sir, to present George Bush’s new “initiative” for the Middle East as a real step forward (leading article, 15 March) is merely to add to the hypocrisy which fuels anti-Western sentiment around the world. Of two Middle Eastern countries in non-compliance with UN resolutions, country A is starved almost to death and deprived of essential imports for the maintenance of its infrastructure, then threatened with some 200,000 soldiers, and at the precise moment when progress towards compliance is greater than ever before, looks set to become the victim of a devastating military campaign. Country B is treated essentially as any other state for more than thirty-five years, then, in an attempt by world leaders at establishing perfect even-handedness in their approach to all countries in the region, is issued with a warning of a most threatening nature, namely, a statement of intent to publish, at an early date, a three-year road map which might possibly, in the future, bring about a result vaguely resembling compliance with the original resolution. Would not a policy somewhere in between towards both these countries yield better results for the Middle East as a whole? Needless to say, the letter wasn’t even published by the newspaper. This entry was posted on Saturday, 16 March 2013 0:32 at 00:32	and is filed under Uncategorized. You can follow any responses to this entry through the RSS 2.0 feed. Both comments and pings are currently closed. We read this years ago, in facts some news saying this matter discussed before Afghanistan invasion. also some telling before 9/11 Iraq was on the table. 1-	why there is attention for invading Iraq? 2-	Is Saddam is was the motive behind this long time talks? 3-	Is the oil and resources of Iraq behind that? 4-	Any other reasoning you can prove for us that drive the invasion of Iraq. NBC reporter Peter Arnett, the Pulitzer prize-winning reporter Peter Arnett after he gave a controversial interview to Iraqi state television in which he said American military plans had failed. Later who was controversially fired for comments he made about the invasion. Is this all you can bring yourself to say on the 10th anniversary? Drag out the wicked Zionists!! For the record – Since March ’03 country B has had 3 general elections based on proportional representation and then formed coalition governments, just like happens most of Europe. Country B holds the distinction of being the first country in the middle east to have constitutional democratic elections on European lines. But since March ’03 country A has also had 3 general elections based on proportional representation and then formed coalition governments, as do most of Europe and along with Country B. Country A has the distinction in history of being the first Arab country to hold constitutional elections on European lines, was the first Arab country in history to do so and is still doing so after 8 years. Might have been worth a mention from a historian RV? Especially one who has been blogging the Iraqi parliament for all these years? You have short memory. Iraq had many good elections during the monarchy. Then what’s the use of an election if it does not lead to peaceful transfer of power? What we have now is a prime minister who does not want to leave his chair. And elections under insecure condition is Not Representative. Democracy does not work in wars. Unfortunately, insecurity polarizes the votes along sectarian lines which serves Maliki’s sectarian policies. I agree with you Faisal about Bb short memory. The problem with Iraq war is based on pile of lies, the only good outcome was is thrown a tyrant, but looks that was not a goal nor for the sack of Iraq neither for Iraq. This well resulted after 10 years of war. If some still thinking the war/invasion of Iraq bringing democracy to Iraq and the region, sadly they are in deep sleep and dreaming. “Now, we didn’t go to Iraq to bring democracy to the Iraqis. And I try in the book to really explain that that wasn’t the purpose,” she said. Ah Faisal Kadri, I doubt very much the elections held under the short lived monarchy in the 1920s can in any way be compared to the 7 elections, general and governorate, that have held in post-Saddam Iraq in the part 8 years. But at least you didn’t cite the elections held under the Saddam regime! Ever since 2006 the Iraqi government has been comprised of a coalition of all the major parties representing the broad cross-spectrum of the Iraqi polity. The locus has always been the Iraqi parliament, as you would know from following RV’s blog. The powers of the parliament to act as break on executive control have been continually demonstrated. These powers arise from the constitutional referendum in 2005 where Iraqis voted in the face of a depraved insurgency. Despite all the difficulties of ongoing terrorist violence, these arrangements have so far stood the test of time. Predictions of civil wars, of collapse, of coups, have not transpired. More than 8000 candidates are standing for the 450 or so council places in the forthcoming local elections demonstrating that the Iraqi/Arab appetite for the novelty of the democratic political process has not abated. 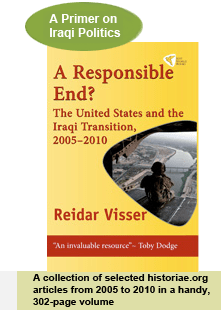 10 years since the inva­sion of Iraq, Arabs and Iraqis still remem­ber the image of the man who led Iraq’s counter-psychological war­fare, an icon of man stood alone fac­ing a giant West­ern media lies led by the two crim­i­nals the US pres­i­dent Bush and the UK Prime Min­is­ter Blair and the rest of the gang to com­mit the biggest rob­bery of the cen­tury, and the evi­dence are emerg­ing for ten years every day. Al-Sahaf has suc­ceeded to cre­ate a bal­ance point with West­ern media pro­pa­ganda super­vised by the CIA and the MI6 against Iraqi and Arab minds before the mil­i­tary oper­a­tions. his ter­mi­nolo­gies and vocab­u­lar­ies he used such as (Oluj, sim and Ulkum) are still in cir­cu­la­tion today describ­ing West­ern enemy sol­diers and invad­ing aggres­sor in all over the Arab countries. Al-Sahaf a pro­fes­sional, patri­otic and nation­al­ist Iraqi infor­ma­tion min­is­ter who refused to accept defeat ‘till the last-minute and suc­ceeded to address the ene­mies in their own lan­guage. Alone, he was the largest Iraqi Arab media out­let spread­ing the truth against the West­ern fraud and decep­tion propaganda.